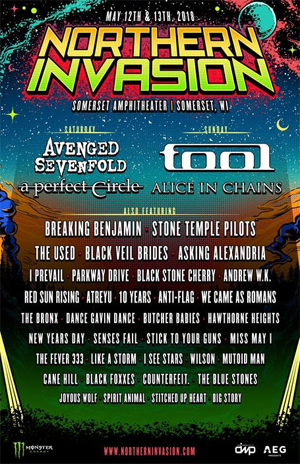 The daily band lineups have been announced for the fourth annual Northern Invasion, Saturday, May 12 and Sunday, May 13 at Somerset Amphitheater in Somerset, WI, and tickets are on sale now at www.NorthernInvasion.com. Northern Invasion 2018 will be bigger and better than ever with over 12 hours of music per day from the biggest and best rock bands on three stages—headlined by TOOL and AVENGED SEVENFOLD--as well as a top tier camping experience. The Northern Invasion Good Eats area includes food offerings from top regional and national restaurants and vendors. Northern Invasion General Admission and VIP tickets (including layaway options), as well as Hotel Packages and All-Inclusive Camping options and Tent or RV Camping add-ons, are on sale now at http://northerninvasion.com/tickets.html. Fans are encouraged to buy early and save. Each ticket price level has a limited number of tickets available, so attendees can save more by buying earlier. Ticket prices will automatically move to the next price level once a price allotment sells out. The layaway purchase option—available through February 15--also allows fans to split the ticket cost into three monthly payments.